We start on Tuesday 24th July until Friday 31st August – so come and join us and join in our BRAND NEW CRAFTS & SPORTS GAMES! The Summer Activity Progamme is packed full of exciting Sports and Arts & Crafts and it’s the perfect way for your children to spend their Summer – trying out new activities, making new friends and having a whole lot of fun! Keep checking our facebook page [@fresh kids shepperton] for all the latest news. We’ve created an environment where all our unique young people can feel at ease, be themselves, feel included and valued. We provide stimulating, fun activities getting everyone active, moving and using their imagination. Activities are balanced each day to encourage communication, cooperation, self-esteem, confidence and team work – while having fun in a friendly and safe environment. Whether your young ones are into football, tennis, gardening, problem solving, getting creative, dancing, team games, dressing up, playing air guitar, food crafts or bouncy castles – in fact, most things – they’ll feel right at home, and you’ll feel reassured. Each day is structured with the same framework as we know how important routine can be, however that doesn’t mean each day is the same – and we’ve got a Special Event every day too! It’s going to be popular, so book your places now! All activities are highly supervised and there really is something for every rising 5 to 12 year old. If you’ve been to a Fresh Kids Holiday Club before and no details have changed, you don’t need to complete a registration form. Just Book Online. 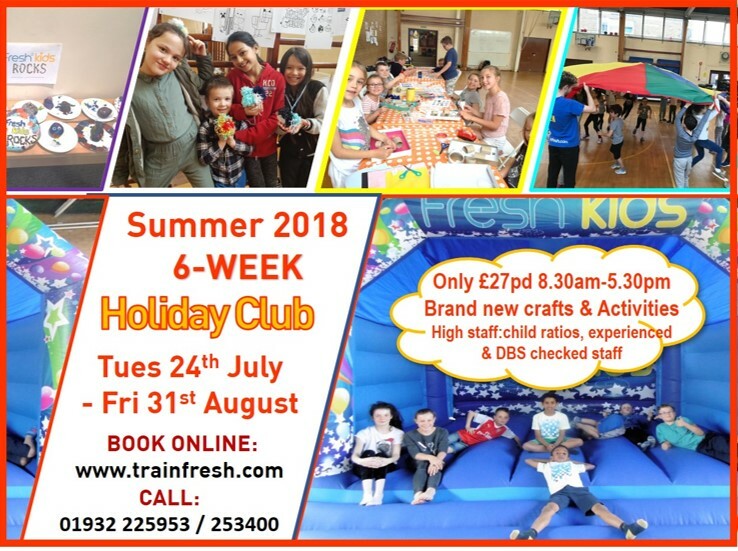 If you prefer, you can download the Holiday Club Booking form and Terms Summer 2018 and return to info@trainfresh.co.ukor to Fresh Reception, Govett Avenue, Shepperton TW17 8AB. If you’re trying us for the first time, please download the Holiday Club Registration Form Summer 2018 and Book Online or download the Booking form. Return to info@trainfresh.co.uk or to Fresh Reception, Govett Avenue, Shepperton TW17 8AB.